There's really no recipe, per se, to this salad... the way summer truly implores you to cook. It's simply a gathering of what's fresh and delicious this time of year... crisp leafy greens and fresh fruit that is beautifully ripe, juicy and flavorful. 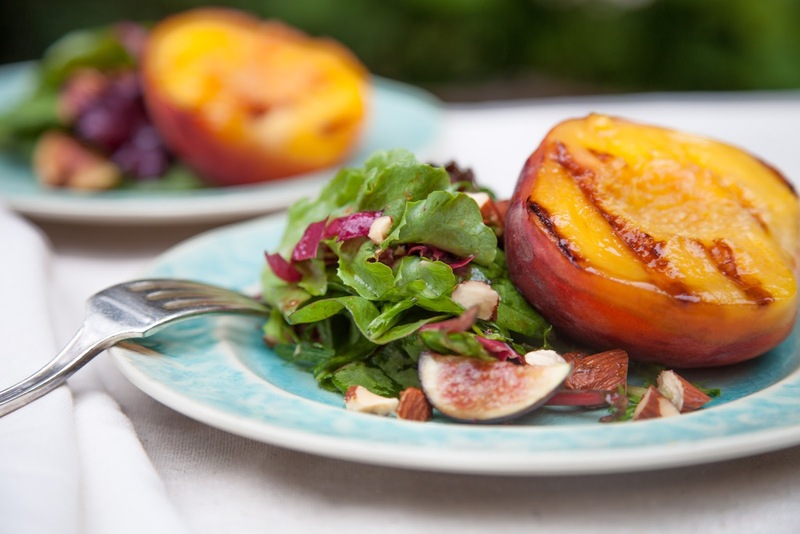 Here I'm using Stemilt's organic yellow peaches paired with little Black Mission figs and some mixed baby greens. These peaches truly don't need one thing to enhance their flavor. Yet, I have to say, just a few minutes on a hot grill does do something magical to them. They warm through just enough, without compromising their firmness; and their sweet, juicy nature is just that much more pronounced... making them a nice partner to cool, crisp greens. For details on this simple summer salad, including an equally simple, quick and tasty vinaigrette that works beautifully with the flavors of fresh peach and figs, check out this week's posting on Stemilt's blog, The Stem.